While many preppers were busy parading the victory of the president elect Donald Trump many states continued to press their liberal agenda with gun grabbing laws that were passed. One such state includes California. Californians overwhelmingly voted FOR Proposition 63. California is known to press the constitutional boundaries when it comes to the second amendment. The shocking takeaway though is that a MAJORITY of Californians voted for this proposition. That either means that only a few gun owners are standing up for their rights or there are not enough gun owners in California to make a difference. Not only does California have some of the toughest gun ownership laws in the country but now they have the toughest laws for purchasing and possessing ammunition. 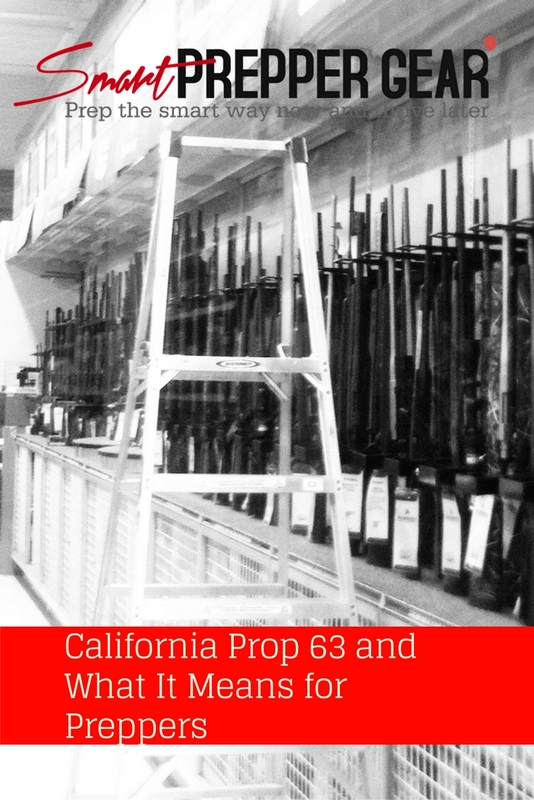 With Proposition 63 you can no longer drive over state lines with ammunition. So if you thought that you could just simply leave California to go purchase ammunition to take some back with you then you are now wrong and can be arrested. There will now be background checks for not only purchasing firearms but also ammunition. This is just another hurdle that California has placed in front of legal gun owners to hinder them from stocking up on ammunition or even going to the gun range. Large purchases of ammunition will be reported to the department of justice. However, there is no specification on what constitutes as a large purchase of ammunition. Sellers of ammunition will have to be licensed to sell. So now companies will have to pay additional to not only sell firearms but now ammunition. This measure is also supposed to prevent private sales of ammunition. However, it would be impossible to track if ammunition has been purchased from a private dealer. This proposition does make it illegal. So that means you can be arrested if you are caught selling ammunition without a license. Gun grabbers especially in California will now feel emboldened to pass more gun control regulations. Since an overwhelming majority voted for the proposition then they will most likely be able to pass much more. Anti-second amendment scumbags will not stop with just this proposition. Other states with gun grabbing liberals will also feel emboldened to continue their anti-second amendment agenda. Contrary to the ignorant belief that they will stop with the election of Donald Trump these liberals will continue to press on. 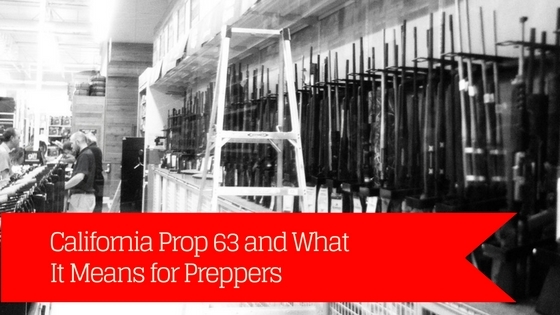 What should preppers in California do? Californian preppers have 2 options: fight or flee. Fleeing doesn’t always mean that you are a coward. Sometimes it is the best decision to keep your family safe. Now when I say fight I’m not talking about loading up your guns and taking over the state capital. This fight has to be done politically. Californian preppers should be harassing their local and state representatives to overturn this proposition. You should also get involved with gun rights activist groups and DONATE towards the cause. The other option is to strategically relocate. When considering this option you have to weigh the costs. If you have family, friends and a stable career in that state then it may be hard to take this into consideration. However, you will have to weigh comfortability against the safety and well-being of yourself and your family. If you are not legally able to defend yourself or your family then is it worth staying in that state? You should also have some sort of pre-paid legal insurance or have a lawyer on retainer at all times. These laws are going to make it hard for legal gun owners to defend themselves and in fact criminalize legal gun owners. A great option to consider is United States Conceal Carry Association. They will provide you with legal representation and reimbursement should you ever get arrested for anything gun related. This is a cheaper option than keeping a lawyer on retainer at all times. What should preppers outside of California do? A majority of preppers believe that president-elect Donald Trump is going to be some sort of Messiah for this country. It is a relief from what we have had in office for the last 8 years. However, if you look back in the history of government and power you can see that power corrupts. Not only that, but the liberal scumbags are going to continue with their tricks to press their gun grabbing agenda. You can’t fully rely on one man to save everything. It just isn’t possible. Preppers should continue to buy guns and parts that have the potential of being banned. Remember, Donald Trump only has a maximum of 8 years in office. This may give us a little time to continue to prepare. Preppers outside of California should also get involved politically by joining gun rights activist groups that fight for gun ownership. Groups like the NRA and Gun Owners of America have proven to be effective and influential in politics.